Your treasured old photographs can be copied and restored at Portraits by Hart. Torn, damaged, faded and cracked photo’s repaired. Portraits by Hart have over forty years of experience in old photograph repair and renovation and all work is carried out on the premises. If you are interested in purchasing any of our images either as prints or as block canvases. Make a note of the reference number of each picture you are interested in and please contact us. 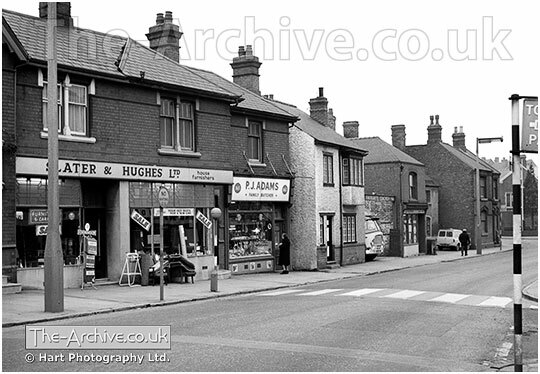 A photograph of Slater & Hughes Ltd. and P J Adams Butchers, High Street, Lye, Stourbridge, West Midlands, Worcestershire. Photographed by multi award winning photographer William R. Hart ABIPP. AMPA. ARPS.